This piece originally appeared at Sidetracked and is republished here with permission. Sidetracked Adventure Travel Magazine is an online journal featuring a collection of personal stories of adventure travel, exploration, journeys, and expeditions. Greenland is a country divided by the ice, with the west and east both linguistically and historically very different. By far the majority of the population, 52,000 out of only 56,000 people, lives in the west, and since this is the world’s largest island it actually makes us the least populated country in the world. One of the great benefits of a land as vast as Greenland is the opportunity to be a domestic traveler and feel like you’re going off the edge of the map. For me, as for so many other people, traveling is all about exploring the “backsides” of our world. In mid-July last year I arrived in the main airport of Kulusuk, a gravel airstrip outside a village of about 250 people, via Reykjavik, which is the easiest way to get there. Greenland to Iceland and then back to Greenland — that’s how to start a domestic journey around here. 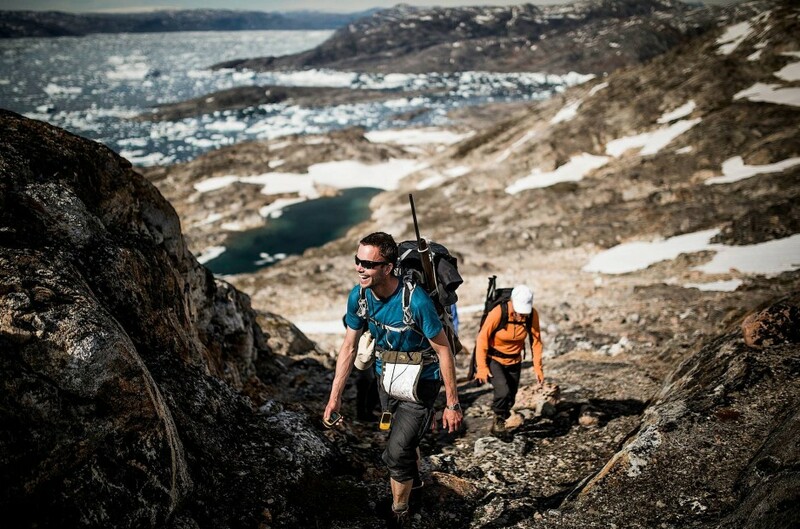 I hooked up with a group of hikers trekking through the mountains along the huge Sermilik Ice Fjord for four days. I was thrown headfirst into the adventure with a five-hour boat ride through ice-packed fjords and sounds, and dropped off in a camp so remote that all locals carry a gun for polar bear protection. From our inland position we trekked south along Sermilik to the tiny village of Tiniteqilaaq, right on the edge of the ice fjord, where people live off hunting in the rich fjord waters. At times along the trek the locals ferried us across narrow straits and along too-rugged-to-hike coastlines in what outsiders often think of as a roadless land — but up here the roads are waterways, flight paths, dog sled routes, and snowmobile trails that require ancient knowledge combined with modern navigational equipment. 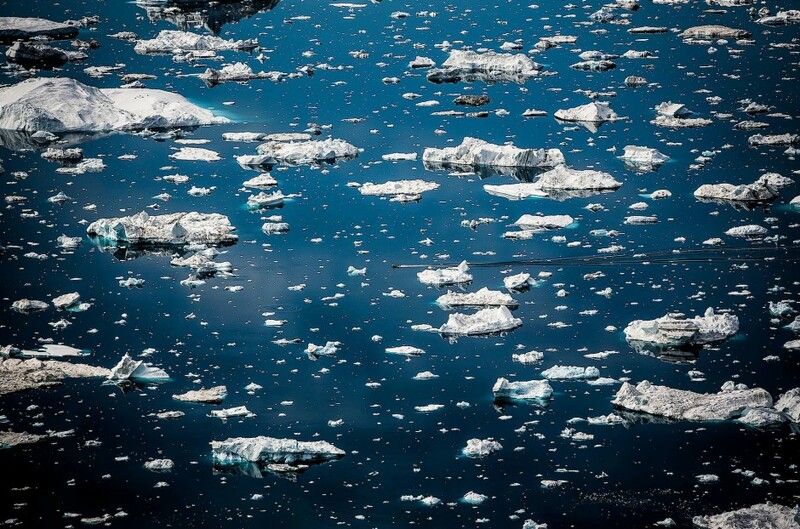 A small boat navigates the maze of icebergs in the Sermilik Ice Fjord near Tiniteqilaaq. All photos by author. 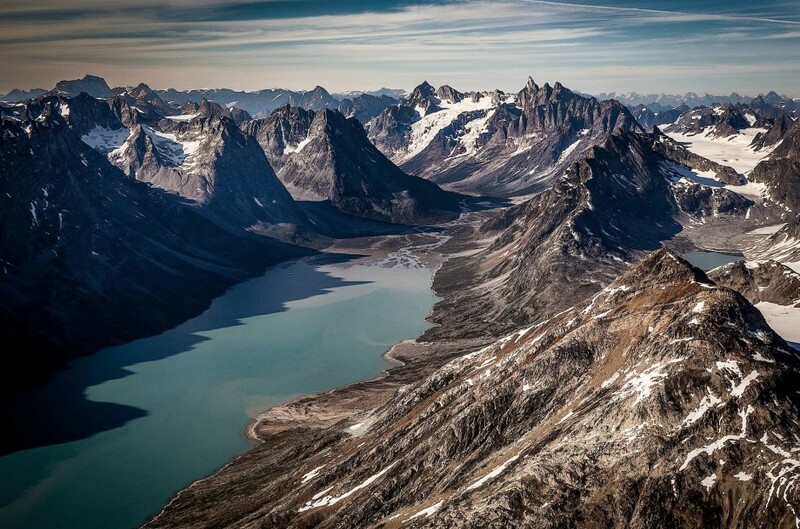 The jagged peaks of the Tasiilaq backcountry are dotted with glaciers and rise straight out of the fjords. 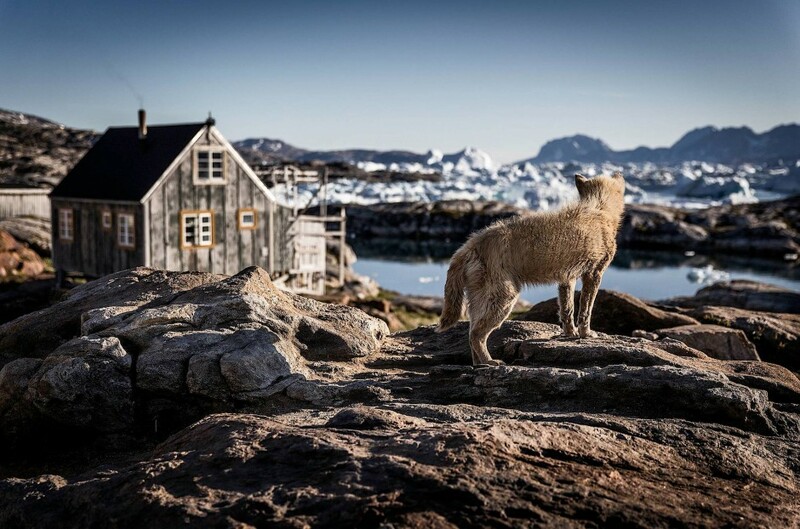 A sled dog in Tiniteqilaaq looks out over the Sermilik Ice Fjord from its summer home. 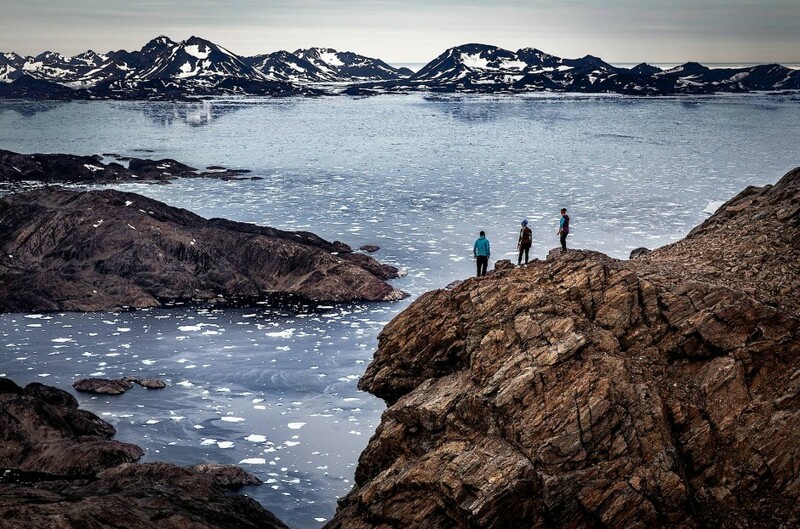 Hikers on Tasiilaq island climbing onto a ridge overlooking the ice fjord and the ice cap on the horizon. 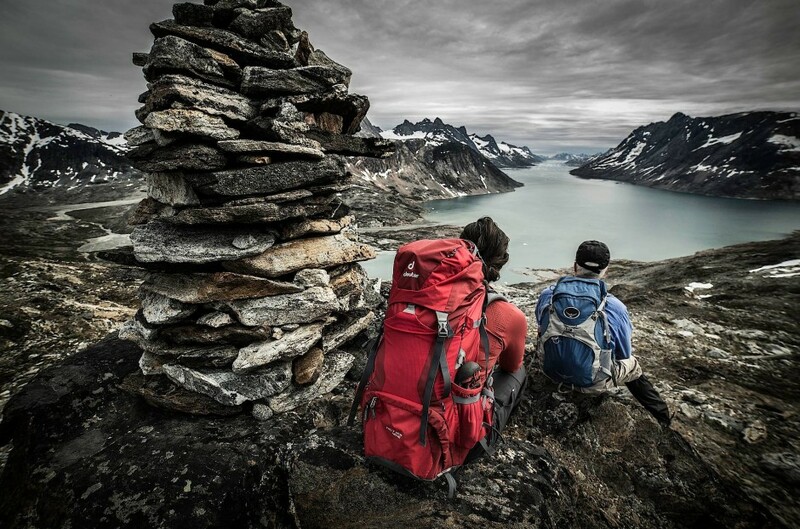 Three local youths from Tasiilaq on an evening climb to the nearby Sømandsfjeldet. Reaching the trail’s end we came to Tasiilaq, the main town in the region. With a population of 2,000 people, it is the center of the district, and it is a place where people move if they follow the main pattern of migration. 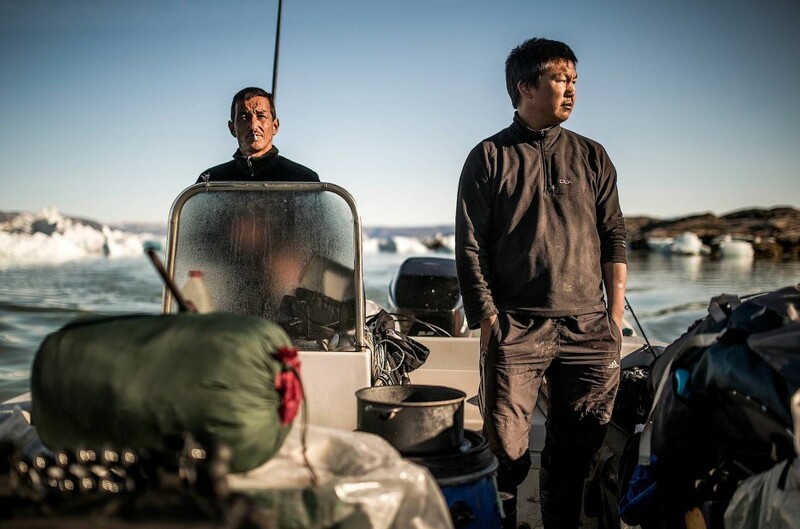 A local hunter from the village of Isortoq invited me on a seal hunt a couple of nights later. Together with his friend Lars Peter, we combed the coastline around town unsuccessfully for six hours on a beautiful summer night. 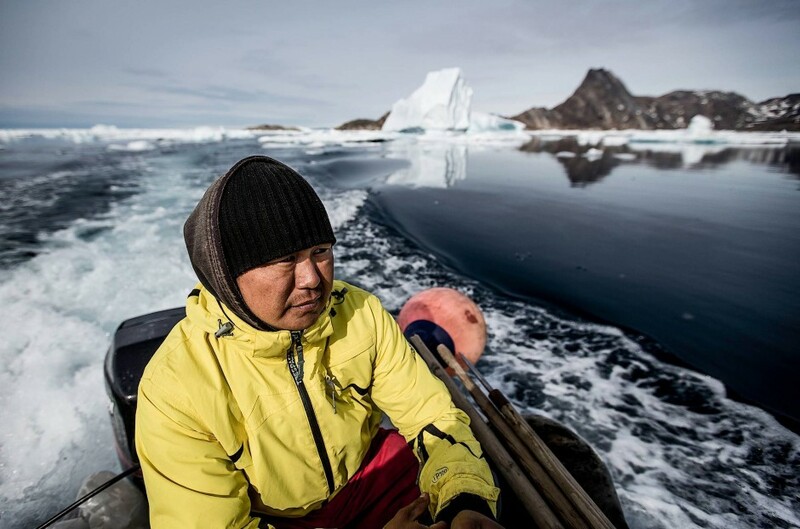 “That’s just what seal hunting is like,” Michael shrugged, powering up his 19-foot boat before carefully pushing and shoving a path through the floes of sea ice that drift south from the Arctic Ocean and block the coastline from the Denmark Strait for much of the summer. A local tour boat shuttling passengers between the airport in Kulusuk and a trailhead in the Tasiilaq backcountry. 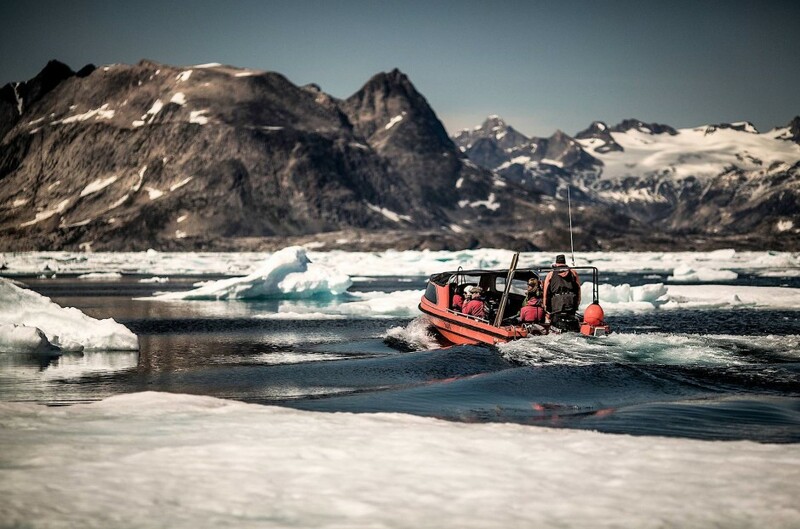 Paulus and his grandson prepare to travel through the Sermilik Ice Fjord in their 16-foot open boat. Camp managers Michael and Lars Peter on an early morning ride between two hiking camps deep in the Tasiilaq backcountry. Subsistence hunters on an evening hunt in the summer sea ice near Tasiilaq. 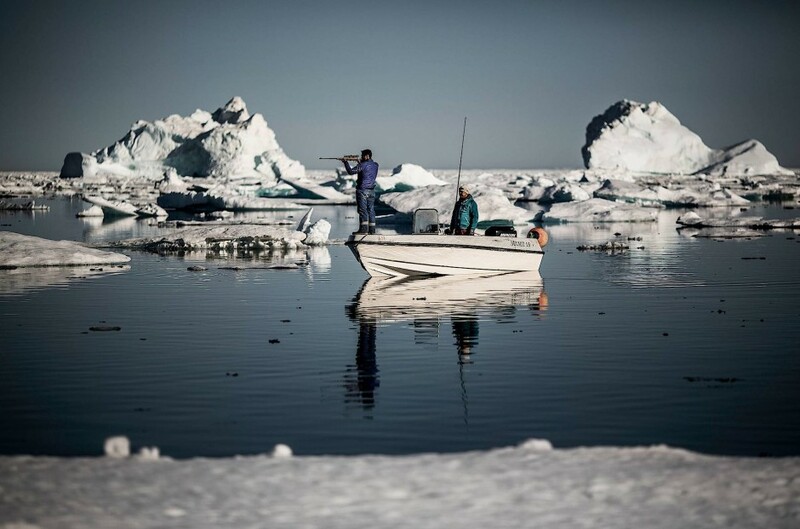 Local hunter and camp manager Lars Peter on a summer morning commute among icebergs traveling from town to a hiking camp in the ice fjord. 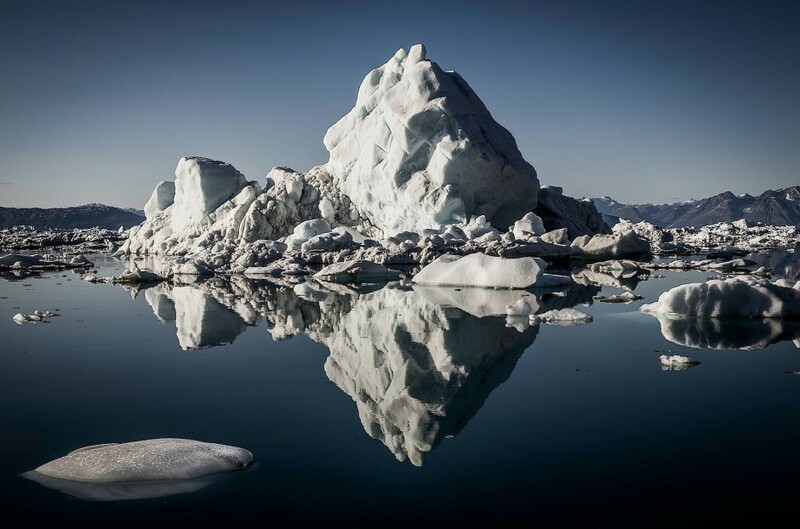 An iceberg doubled by the calm waters of the Sermilik Ice Fjord in East Greenland. Hikers looking towards Tasiilaq island and the mountains they will have to cross in the coming days. 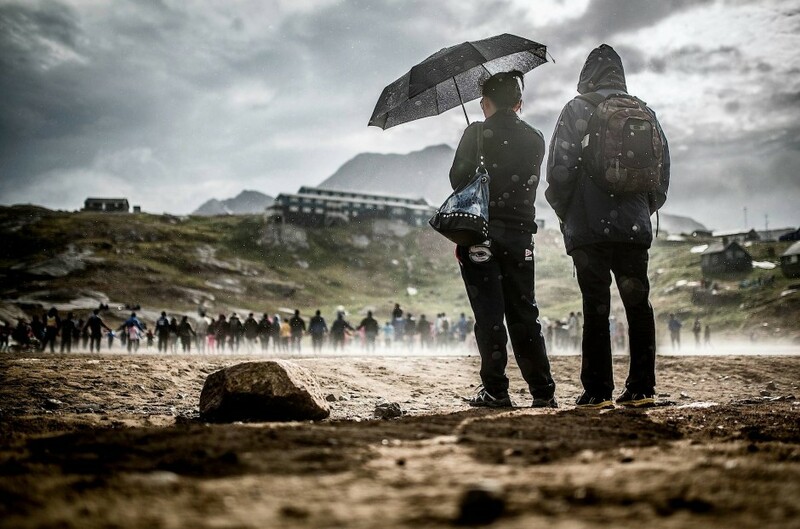 Back in Tasiilaq for the weekend, I was sucked into the hectic atmosphere of the East Greenland Football Championships — as hectic as it gets with 400 people, or about 10% of the entire population of the east coast clustered around a small gravel surface stadium blasted out of the rock. People come from the surrounding settlements to the main town for this annual event, and the entire town is turned into one big football tournament for weeks, complete with DJs spinning the favorite tracks of team supporters, makeshift food carts selling everything from hot dogs and noodles to dried fish and seal, and scores of people dressed in the colors of their home team and faces painted with team names and slogans. 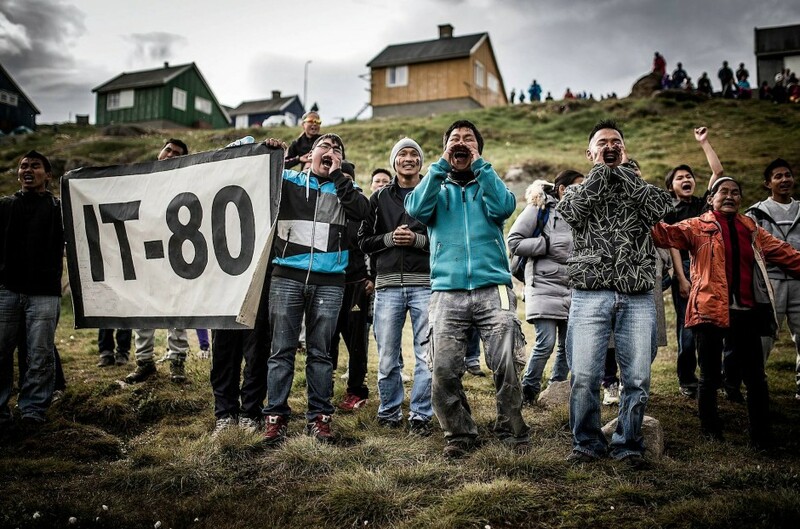 IT-80 football club supporters from the village Isortoq, with just 80 inhabitants, at the annual East Coast Championships in Tasiilaq. 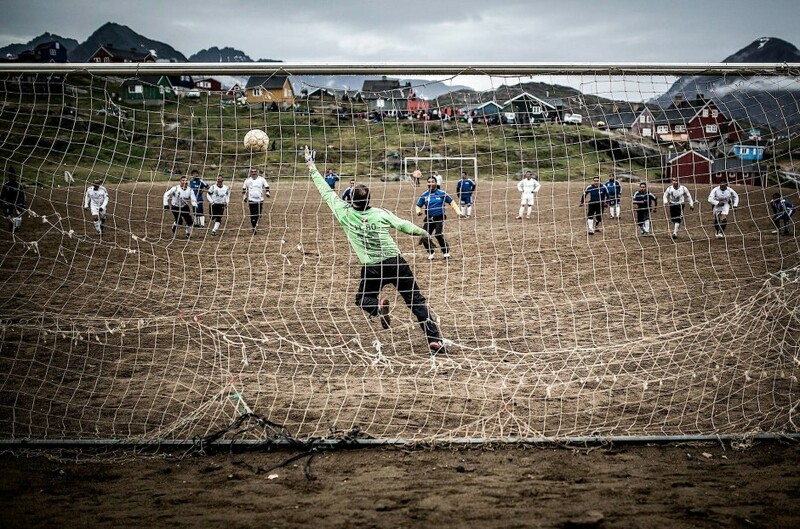 A crucial penalty goal in the Old Boys final at the 2013 East Coast Soccer Championships in Greenland. A crowd of supporters gathering in the football field to celebrate the final game of the 2013 East Coast Championships. Further adventures followed in the coming days before I eventually boarded a flight that traveled over the same landscape I had spent the past two weeks crossing on foot and in boats. Looking down over never-ending ridges and deep fjords and being able to understand the vastness, remoteness, and ruggedness of this place suddenly seemed like the best way to see anything, anywhere. I headed back out via Reykjavik, which felt like the largest and most bustling city in the world after a deep dive into a region of Greenland not very many Greenlanders have visited.